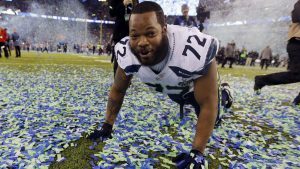 Seattle Seahawks defensive end Michael Bennett recently hosted his Fourth Annual Free Football Camp in Hawaii last month. It was a fantastic opportunity for the youngsters to make new friends, work on their game fundamentals and get some good exercise during their summer breaks. Bennett attributes his giving back to the community personality to his parents, who always made sure to contribute to their local community. The event was such a success that the online registration filled up way prior to when the camp started. The Houston, Texas native played more than one sport during his high school years, but was really a standout football player. He ended up attending and playing for Texas A&M and continued to build a honorable reputation for himself in the sport, and in 2009 he was signed as an undrafted free agents by the Seattle Seahawks. From 2009 through 2012 he went on to play for the Tampa Bay Buccaneers before returning to Seattle who’s roster he’s still on today. The XLVIII Super Bowl Champion was in Hawaii in early July to host his annual football camp, and the kids who got to interact with him and work on some drills couldn’t have been happier. There is no doubt that next year’s event will be equally successful. If your company is interested in finding out availability and booking fees for a professional football player like Michael Bennett or other sports celebrities for an Keynote Speech, Autograph Signing, Guest Appearance, or Football Camp, call us at 1-888-246-7141.